Locata’s COTS systems are in use today for commercial, industrial applications. These COTS applications are well served by the standard Locata system, which operates at the 2.4 GHz radio frequency allocated for industrial, scientific, and medical uses. The COTS version transmits at less than one watt in compliance with relevant Federal Communications Commission regulations for that band, which permits unlicensed operations. Transceivers in commercial applications are typically spaced less than 10 kilometers apart and only have to deal with ground-based vehicle dynamics. When Locata and the 746 TS signed a sole-source contract in 2010 to deliver NGBPS-level capabilities, the challenging USAF specification clearly would require Locata to demonstrate that its synchronized network of transceivers could deliver new levels of performance in environments that the system had not previously experienced. Enhancement 1 — Distance: The operational UHARS deployment calls for a NGBPS system that will cover around 2,500 square miles (6,500 square kilometers). The USAF-Locata contract specifies that a Locata receiver shall be capable of acquiring a transmitted NGBPS signal at a range of at least 30 miles (48.3 kilometers). Critically, the nanosecond-level, time-locked synchronization essential for the Locata network’s performance must be maintained at these ranges, even when the synchronization process is sequentially “cascaded” from one slave transceiver to another slave that is not in view of the Master transceiver site. Before the critical design review (CDR) in June 2010, Locata’s analysis concluded that the NGBPS acquisition ranges required the transmitter RF power for each signal to be increased from the standard COTS level of 100 milliwatts up to a new level of 10 watts to the antenna. Tests proved that transmitting 10 watts enables acquisition and tracking out to more than 50 kilometers and maintains received signal levels at -100 dBm or better. A number of external amplifiers were tested over a period of months, and a suitable candidate was chosen for the Tech Demo deployment. The accompanying figure shows a plot of measured data for received power versus tracking distance, using two test aircraft antennas, and recorded during the CDR wide-area trials. 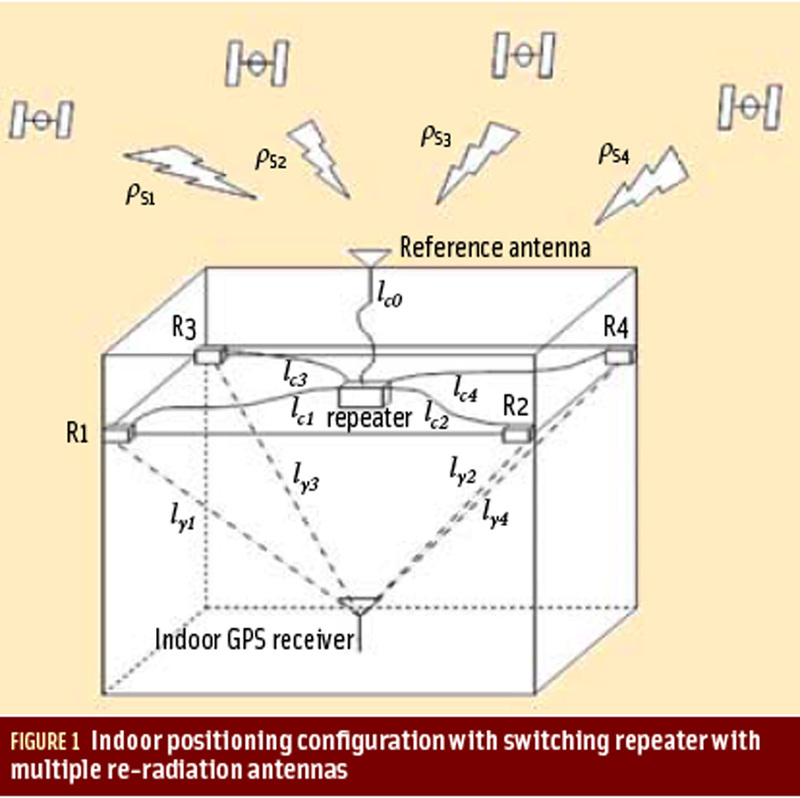 Enhancement 2 — Antennas: In the past, Locata COTS networks provided positioning to ground-based users, transmitting signals from either a patch antenna pointing from the perimeter into the area of interest, or from a monopole antenna radiating equally in all directions from a transceiver within an area of commercial operations. However, neither of these antennas provides an optimal radiation pattern for NGBPS signals to be used by aircraft overhead. A monopole antenna, when oriented to provide the necessary omnidirectional pattern horizontally, suffers a null in its radiation pattern to its zenith. Aircraft above the transceiver will suffer signal dropout, and the consequent loss of that site for the geometry required for accurate positioning. This is particularly troublesome if a 3-D solution is required, since the transceivers near (or under) an aircraft provide the primary signal components for vertical positioning. Alternatively, a patch antenna, when oriented upwards, provides good signal strengths for overhead users. However, because of its flat geometry, it does not provide good gain to the sides and will therefore severely limit the operational range of a synchronized network. Reconciling these conflicting requirements led to an intensive search for a better aviation antenna for Locata and NGBPS uses. After months of testing it was decided that a quadrifilar helix antenna design would best deliver the required NGBPS system performance. This led to Locata’s in-house fabrication and prototyping of several quadrifilar helix antennas specifically for testing under NGBPS conditions. Once an optimal design was determined, Locata worked with a very capable and respected antenna manufacturer to produce an aircraft-certified version of this quadrifilar helix antenna. These quadrifilar helix antennas were used in Locata’s Australian tests with excellent results and confirmed Locata’s research and analysis. The production antenna also gave excellent performance throughout the Tech Demo, and these antennas can be seen in the accompanying photo of the USAF aircraft and even more clearly in photos of the transmitter sites. Enhancement 3 — Dynamics: Prior to the NGBPS flight trials, Locata COTS systems had only been used to position ground-based vehicles, such as cars, trucks, and drill rigs. For the NGBPS, however, the system needed to function under aircraft operating dynamics, including banking, angular and linear accelerations, airspeeds up to 300 knots (560 kph), and altitudes up to 30,000 feet above sea level. Prior to the Tech Demo at White Sands, Locata did not have access to an aircraft that could match these performance requirements; so, all dynamic testing had been simulated, using a bench-test setup to analyze Locata’s tracking loops and a hardware-in-the-loop scenario. In these simulation scenarios, the transmitter direct digital synthesis (DDS) chip in the transmitter section of a transceiver was commanded by software to replicate the appropriate frequency plus Doppler shifts that would be seen by a receiver on board an aircraft engaged in the specified dynamics. The receiver portion of the LocataLite transceiver (which is identical to a Locata roving receiver placed on the aircraft) then tracked this synthesized, dynamically modified signal. In this way, simply using Locata test software and transceivers, the tracking loop development and performance was simulated and verified. This simulation demonstrated that Locata’s receiver tracking loops could handle the specified aircraft dynamics, a conclusion that was borne out with real-world aircraft dynamics tracked during the Tech Demo at White Sands Missile Range. Enhancement 4 — Tropospherics: For the NGBPS flight trials the requirement to track signals up to 30 miles means that tropospheric delay comprises the major error source for measurements used in the navigation solution. Using standard atmospheric parameters, the unmodeled tropospheric delay is approximately 280 parts per million (ppm), which equates to approximately 13.5 meters of error over 30 miles. Therefore, in order to meet the position accuracy of less than 18 centimeters 3dRMS (when PDOP < 3), a key challenge in upgrading the COTS for the NGBPS involved developing methodologies to mitigate the effects of tropospheric error. Locata has developed new tropospheric models that make use of meteorological stations that measure temperature, pressure, and relative humidity at the ground-based LocataLite sites and data on the aircraft. The remaining “residual” tropospheric error is then estimated in the navigation Kalman filter solution. For the NGBPS trial at White Sands, the meteorological equipment for the aircraft did not arrive in time for the tests. The launching of weather balloons at the start and end of each test assisted Locata in refining postprocessed models to estimate aircraft data from the ground-based meteorological sites. The analysis conducted thus far indicates that the modeling alone, using data input from meteorological sites, is able to mitigate the tropospheric effects to within a few part per million.